Living in Wisconsin, I often see vehicles that reflect the local flavor. Madison is the “cultured” part of the state, but that doesn’t mean we don’t have our fair share of neckishness. 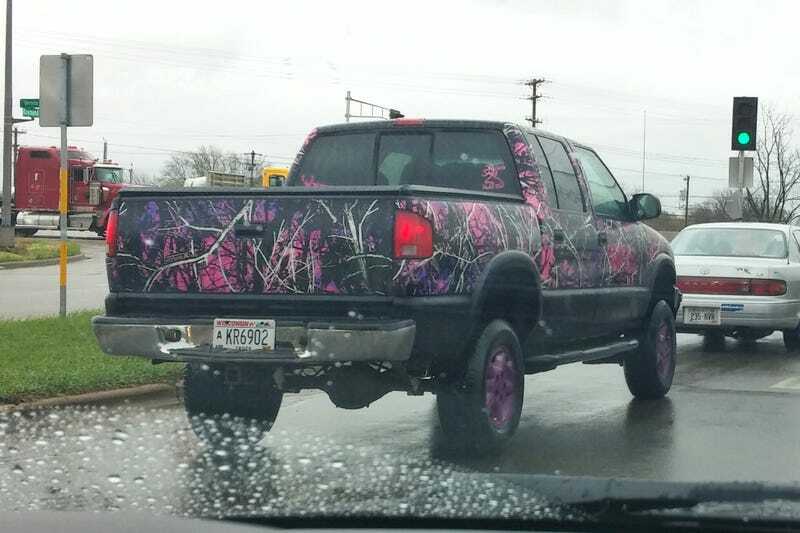 For example, this lifted Chevy S-10 crew cab with a pink camo wrap and purple painted wheels. Other lovely details include the Girls Hunt Too! (with a buck’s head) sticker in the bottom right of the rear window, and what might be either a joke on those family stick figure stickers with a bunch of buck’s heads in the bottom left, or it’s just a kill list, or it’s both. No word on if she was on her way to Gander Mountain or Cabela’s.